In a recent post, Wolfgang writes "Many PLE discussions seem to suggest the creation of a one-stop-shop portal application for life-long learning organisation (e.g. PLEX). The aim is to bring a variety of dispersed web services together for the learners benefit and self-organised by the learner. Does this actually require a platform?...The question therefore is: If learners are totally capable of blending various environments together, be it flickr, VLEs, messaging tools, mobile phones, television, etc., why would we want some middleware to do just that?". In the same direction Stephen asks "What, indeed, is the value-add of the PLE?". I totally agree with Wolfgang and Stephen that we don´t need a top-down integration of different services into a centralized platform like PLEX and Elgg do. In my opinion, PLEX is not more than a desktop application and Elgg is just another online portal or a new centralized LMS. We do however need a learner-driven bottom-up integration of different services into a unique PLE. In this sense, we don´t need a trusted site that supports OpenId and acts as an identity provider, our PLEs will be our identities. I argue here that we do need a learner-controlled unique integrated environment bringing together multiple services into one place. We liked and widely used RSS aggregators which collect RSS feeds from many sites and present the content on a single page. We would also like a federated search engine that allows searching of distributed multimedia repositories with a single query and present the result on a single interface. We tend to like all-in-one devices suitable for every purpose. I´m sure many of us will like Apple iPhone with a widescreen iPod, multi-touch display, digital camera, mobile phone, Web browsing, maps, searching etc. integrated into one device. In an earlier post, I suggested a new learning approach based on "personal environments, loosely joined" and mentioned that a PLE is characterized by the freeform use of a set of lightweight services and tools that belong to and are controlled by individual learners. The idea is to provide the learner with a myriad of services and hand over control to her to select and use the services the way she deems fit to create her integrated PLE better adapted to her own situation and needs. To the technical question of how PLEs can be best deployed, I believe that the challenge is how to design a PLE as an extensible framework that can be complemented with different supporting components. In a software development context, a framework is a collection of abstract classes and interfaces that are used to express abstract design. The developer can then implement the interfaces and abstract classes provided by the framework and create her own extensions. The design of a PLE can be similar to the design of an integrated development environment (IDE) such as the Eclipse IDE. 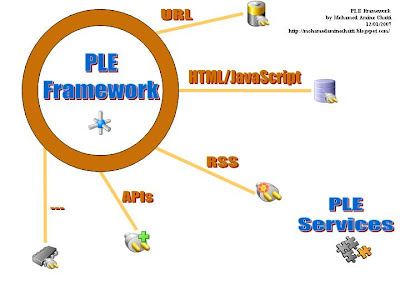 Similar to Eclipse which has plugins for different programming languages such as C\C++, Python, Perl, Ruby, PHP, design tools and many more plugins, a PLE can be designed in such a way that it can easily be extended with new learning services and tools. Learners should be able to copy&paste, drag&drop and mash third-party services directly into their PLEs based on their needs and with a minimum effort. The link elgg.net just goes to an online community used by eductors. I'm not sure what you mean by "the PLE would be your identity"? Identity management is a fairly complex proposition that requires a lot of trust management. Wouldn't you want a third party to do that trust management for you? Also, wouldn't using OpenId give the learner even more control of that identity? I may need to back and read the links you reference to understand. I really like your idea of allowing the learners environment to be an extensible framework supporting additional components. I am experimenting with a string'n'glue PLE framework called Stringle which is intended to act as a lightweight 'wrapper' within which you can bundle applications, pages etc. Configuration is handled using opml and rss feeds generated by third party services (like delicious, for example).